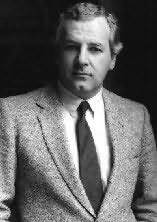 David Craig Owen Thomas was a Welsh author of thrillers, most notably the Mitchell Gant series. The son of the Western Mail rugby union writer, JBG Thomas, Craig was educated at Cardiff High School. He graduated from University College, Cardiff in 1967, obtaining his M.A. after completing a thesis on Thomas Hardy. Thomas became an English Teacher, working in various grammar schools in the West Midlands, and was Head of English at the Shire Oak School, Walsall Wood. After unsuccessfully trying script writing for radio, Thomas wrote part-time, with his wife as editor, in two fields: philosophical thoughts in books of essays; and techno-thriller genre, which although invention is often attributed to the better-known Tom Clancy, many feel that Thomas was its true originator. Most of Thomas's novels are set within MI.6 and feature the characters of Sir Kenneth Aubrey and Patrick Hyde. His best-known novel which brought him to global prominence, Firefox became a successful Hollywood film, both directed by and starring Clint Eastwood. After writing his third novel, 1960s Cold War espionage thriller Wolfsbane, he left teaching altogether in 1977. His later books include Snow Falcon and A Different War. Shortly before his death he finished a two-volume commentary on German philosopher Friedrich Nietzsche. Thomas and his wife Jill had lived near Lichfield, Staffordshire, but moved to Somerset in 2010. He died on April 4, 2011 from pneumonia, following a short battle with acute myeloid leukemia. He was 68.